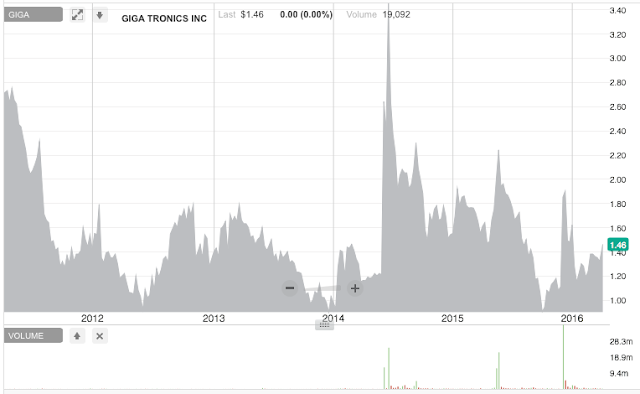 Gigatronics (GIGA) operates two divisions, Gigatronics and Microsource, out of their facility in California. 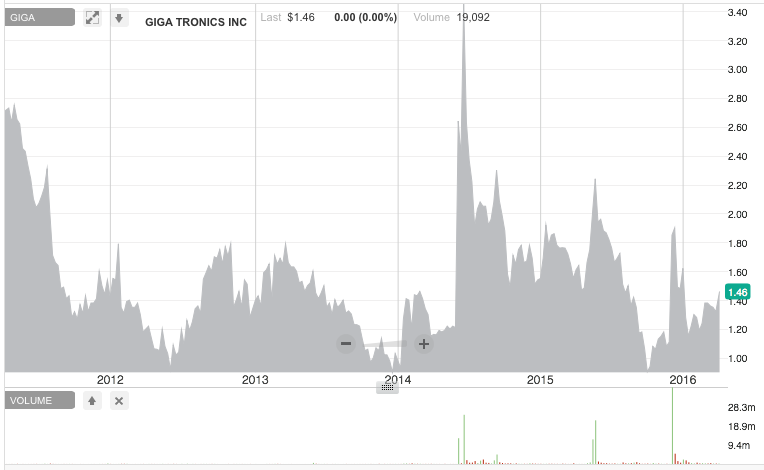 Gigatronics was started in 1980 with Microsource acquired in 1998. 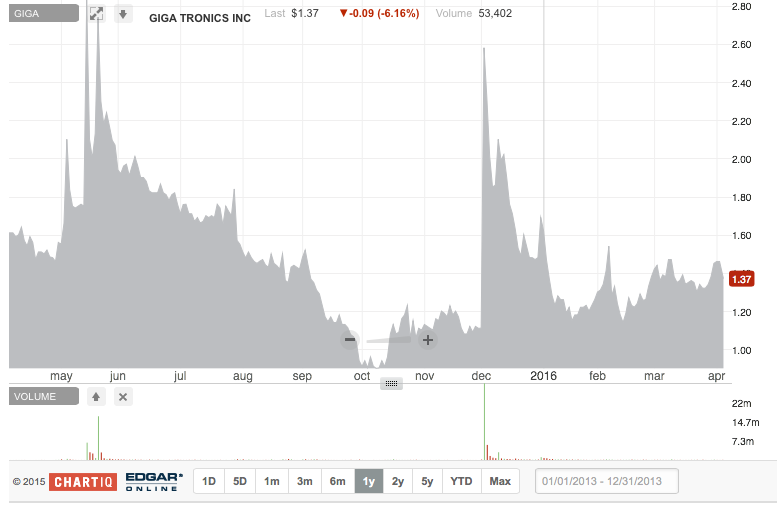 Giga-tronics Division designs, manufactures and markets a broad line of test and measurement equipment used in the development, test and maintenance of wireless communications products and systems, flight navigational equipment, electronic defense systems and automatic testing systems. These products are used primarily in the design, production, repair and maintenance of commercial telecommunications, radar, and electronic warfare equipment. Microsource develops and manufactures a broad line of YIG (Yttrium, Iron, Garnet) tuned oscillators, filters and microwave synthesizers, which are used by its customers in operational applications and in manufacturing a wide variety of microwave instruments and devices. The company has been losing money. Net income for the past 4 years: -$5.8M, -$4.2M, $-3.7M, $-1.7M. And book value for the past 4 years: $6.7M, $3.3M, $0.9M, $3.0M. They have been selling stock to raise money and stay afloat. Recently in Jan 2016 they sold 2.7M shares of common for $3.4M. Going forward there are two main products. Microsource has a new YIG filter while Gigatronics has the Advanced Signal Generator (ASG). The company has made a decision to let go of the past and move in a new direction. They sold their SCPM line in 2013 then sold some more legacy lines to Spanowave in Dec 2015 for $1.5M. The company said they are still on the lookout to sell more old lines. The most recent 10Q explains that they've "changed the focus" of GIGA and "de emphasized some legacy products due to low margin and limited growth." I like to see this sort of thing in a turnaround. The company is not sitting around doing the same old thing but rather monetizing their old garbage to pay for new expansion. Of course I don't know if it'll work out but I like to see them try. Microsource already makes and sells filters and this is the next generation. These filters are used in fighter jets such as the F15, F16, and F18. As a means of extending the life of the jet these planes are being upgraded with new radar. The new radar is so powerful it interferes with other electronics on the plane. The YIG filter fixes this intererence. Planes require up to four of these filters depending on the configuration. F18s take 1 filter per plane and this work is ramping down as the life of the plane expires. F15 work is ramping up and takes 4 filters per plane, one for each radar antenna. F16 is the new plane and can take 2-4 filters; the current order is for 2 filters per plane while there are some international governments with planes requiring 4 filters. As I said, the current YIG filter product is used when upgrading radar for these older existing planes. Microsource sells to a prime contractor who is doing the actual plane work. Management tells me they expect this upgrade work to last at least the next 5 years. Beyond that it's hard to say and depends on what governments do with the new F35. Will they replace all older planes with the F35? The F35 does not require any Microsource YIG filters. Outside of these filters Microsource will move on to the next product. This is what they have now as their main product. So let's talk some numbers. The filter development is complete and it's in production. Right now they have a $10M order which will start shipping in fall 2016 and last for 2.5 years. That'll be about $1M per quarter. Microsource is the sole supplier of these filters. In the Q3 conference call the CEO said this business could exceed $100M over the next 3-5 years which would be $20-30M annually. The CEO also said each filter costs $35k and there are >3000 F16s in the world. If we assume that 2000 of those F16s get updated with 2/3 having 2 filters and 1/3 having 4, that makes $103M. Spread this out over 5 years and you get $20M annually for a company with $16.3M in TTM revenue. Management explained one way to think of the company to me: Microsource provides the stable predictable cash flow to keep them going while they swing for the fences with the ASG. The advanced signal generator is an adaptable hardware platform for the threat simulation market. The ASG emulates radar and electronic warfare signals to test fighter jet systems while on the ground. Management says the ASG has several operating modes with threat simulation being the first one they are developing. I tried unsuccessfully to get more info on the other modes but I do know they consider the ASG to be a configurable platform upon which they are building the future of their company. The ASG has 10x the revenue of their old signal generators at a "substantially higher margin." The first question I have when told of a new product or new market direction is what makes you different. Why will people buy this ASG rather than other solutions on the market? Management says theirs is the only one to provide a complete off the shelf solution. Other products are large cost, large development, one-off custom solutions requiring heavy setup and calibration. Management says the ASG is like a laptop to their competitor's mainframe. In Dec 2015 GIGA signed a deal with Lockheed Martin to provide software for the ASG. Lockheed is now adapting their threat simulation software package to the ASG hardware, to be completed in Aug 2016. The Lockheed software completes a threat simulation system management believes to be a huge opportunity that significantly expands product reach. GIGA will license the s/w package for some cost per unit sold with minimum payments. They can only sell the complete system in the US due to government restrictions but can sell the standalone ASG h/w internationally. The ASG h/w has shipped to several customers and management says it has been well received. Management believes the ASG will be a revenue contributor for at least a decade. The CEO has said they see the threat simulation market as about $100M annually. In May 2015 they also said they are looking to grow the ASG to $30M in revenue. This was before they had the Lockheed s/w deal signed. The company recently told me they are hoping to grow to $50-60M annually in ASG revenue. Again we're talking about a company with $16M revenue TTM. The latest 10Q says the company has lost and is trying to regain AS9100C certification. I asked management about this and it doesn't sound like a big deal. Or at least they don't believe it to be. They say they lost certification in Aug 2015 due to downsizing; they could no longer focus on the little details required. AS9100C is required for flight equipment on airplanes but not for bench top equipment. GIGA got back ISO9000 certification for bench top equipment in Dec 2015; they still do not have AS9100C but say it's not a show stopper. This impacts their YIG filter business which is sold to two prime contractors. One has already brought the product under their own internal quality wing and the 2nd will start shipping in Aug. GIGA has hired a director of quality to get the certification back and plan to have that completed by Aug but if it doesn't happen this 2nd customer will likely just bring it under their quality branch as well. Another issue noted in the most recent 10Q from Feb 2016: the ASG "significantly contributed to the decrease in working capital" over the past few quarters and caused a delay in paying vendors. Some vendors stopped shipping inventory. Management says this situation has been resolved as well. They have gotten creative with the $10M filter order inventory being funded by the prime contractor. They used the cash from the Spanowave sale in Dec 2015 as well as the money from the stock sale in January to pay vendors and suppliers. They say this was an issue with the long lead time items but is good to go now. First I need to just note the duality of this investment. Just read this line from the most recent 10Q "these matters raise substantial doubt as to the ability of the company to continue as a going concern." That is harsh. Then there's talk of $50M in annual revenue from the ASG plus $20M from YIG filters. Really two opposite directions. Best bet is GIGA is dead. No reason to assume the new product 1) really will get to production any time soon (look at the history and number of times in the past that we've been told it's already in production) or 2) will sell at a profit, since their overhead keeps going up as they sell off their product lines.